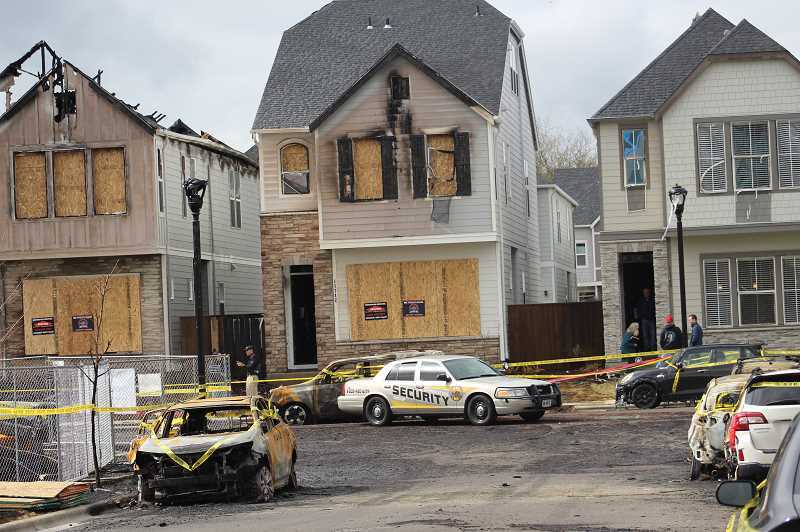 Though maybe in a less noticeable way than Tualatin Valley Fire & Rescue, police agencies and investigators, the City of Wilsonville also played a role in responding to the fire March 31 that damaged or destroyed many homes in the Villebois community. "I'm very proud of our staff. They are very dedicated to their jobs; they care immensely about the Villebois community, the cleanup efforts and assisting that community during this difficult time," City of Wilsonville Assistant City Manager Jeanna Troha said. Two City staffers visited the site in the hours after the fire to assist the fire department and shut down roads. Staff also cleaned up sidewalks and roads in the subsequent days and the City's building inspectors inspected the damaged homes the following week. Also, making sure debris didn't contaminate the stormwater system and that underground pipes weren't damaged was a primary concern for the City. "We took mitigation measures the day of the fire to prevent impact to the environment from (stormwater) runoff from the fire scene and we will continue to assess those systems and continue to monitor them to make sure they're operating properly," Troha said. This week, the City used its regular Closed Circuit Television contractor to check underground pipes near the vicinity of the fire to see if they had been damaged and also hired a forensic engineer to evaluate other infrastructure such as sidewalks and streets. It also assessed whether the underground connections between homes and City infrastructure weren't damaged. "From what we saw at several of the houses that caught fire, the caps from the cleanouts (pipes that provide access to a sewer line) actually melted. And we wanted to make sure that, the heat was so intense, the sanitary laterals (pipes) that are underground didn't get damaged. We doubt it but we're going to check it," Wilsonville Public Works Operations Manager Martin Montalvo said. Also, Montalvo said debris contaminating the water system wasn't a pressing issue. "That's going to get cleaned out. I'm more worried about damage. If a pipe is damaged in some way we're going to have to open it up and repair it," he said. Troha said the City will soon assess its response to the fire. "We will be assessing our response to the event but we are currently in the recovery phase right now," she said. "At some point we'll have those discussions." TVF&R incoming Chief Deric Weiss said the fire department would also begin to assess its performance in the fire in the coming weeks but that his general impression was that things went smoothly. "I just haven't heard a ton of stuff from the crews," he said. "Everything went really well for this fire for a chaotic scene." But one thing Weiss hoped Wilsonville residents would take away from the fire is that they should develop and practice an emergency evacuation plan. "It's great that you talk about it as a family but nothing beats good old fashioned practice," Weiss said. "Take it seriously and practice it." As for the investigation of the fire's origin, Wilsonville Police Chief Rob Wurpes said last Friday that investigators were still waiting for laboratory results. A previous version of this article incorrectly stated the owner of Sophia Park and Palermo Park.